Editor’s note: This post originally appeared on TechNode, an editorial partner of TechCrunch based in China. Momo, China’s top location-based social networking app, has continued its impressive user growth from last year and added solid financial figures to back it up, according to its most recent earnings report. The company, which was previously backed by Alibaba, went public when it listed on Nasdaq in December 2014. The firm’s revenue recorded a significant 524 percent year-on-year jump to $246.1 million in Q4 last year, while its annual revenue soared 313 percent to reach $553.1 million. Momo reported a non-GAAP earning per share of $0.44 in Q4 and $0.87 for the financial year. Away from the financials, Momo’s monthly active users reached 81.1 million as of December 2016 from 69.8 million a year previous. That jump is rebounding to the kind of numbers it recorded in early 2015 when the service reached peak popularity. That’s an impressive comeback considering the company began seeing stagnant active user growth in H2 2015. Momo previously said slowing smartphone sales and a lack of software updates were the reason for the stagnation, but its focus on new business areas — and particularly live streaming — have helped reinvent the company and its app among Chinese users. Momo is certainly not aiming to become a live-streaming company even though that side of its business now represents nearly 80 percent of its revenue. Rather, the company has evolved from a simple location-based feature that helps people discover new relationships to take on different kinds of entertainment. Today, it is a platform that accommodates a variety of different social and entertainment use cases, including one-on-one communication, group chats, social postings of various formats and, of course, live broadcasting and short videos. Momo has recorded profit for eight consecutive quarters, but 2016 was the real start point for its rocket-like growth. Like many other social networking services in China, live streaming was the significant boost for its business, generating $194.8 million revenue during Q4 alone. 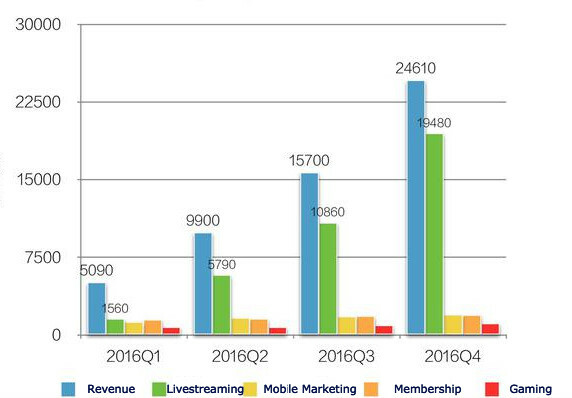 Since it was added to the Momo service in Q3 2015, live streaming has taken an increasingly larger share of Momo’s revenue stream, to the point that it is now dominant today. Live streaming alone isn’t a money spinner — that’s where the business mode comes into play. Virtual gift-based live video streaming has become highly profitable in China — that’s to say that users buy small “virtual” items that they send to their favorite streamers to get attention, convey their gratitude, etc. Momo’s live video streaming business adopted a similar commercialization model in which the platform enables viewers to buy virtual gifts for singers, with the revenue split between the broadcaster and Momo. For now, it has focused on its own user base, but there are grander plans to expand the platform’s reach. “We believe we are still early in the monetization process and have many opportunities to drive further growth year… In 2016, we have primarily relied on converting existing Momo users onto the live streaming service. In December 2016, the service covered around 23 percent of the daily active users for the main application. In 2017, we plan to expand the user acquisition effort beyond the Momo platform,” said company CEO Tang Yan in the earnings conference call. The rest of the company’s annual revenue was primarily derived from membership fees on the dating side of its business, gifting on its social network and marketing and gaming income. Value-added service revenues from their social network, which totaled $19.1 million in Q4 2016, mainly consisted of membership subscription revenues and virtual gift revenues. The firm cites the increase of premium VIP users and total users, as well as virtual gift service, as the reason. Mobile marketing revenues recorded a 29 percent annual growth to $19.7 million in Q4 2016, mainly driven by more new customers and orders introduced by sales agents, as well as the increase of eCPM (effective cost per mille) of the in-feed advertisement service. Momo’s mobile gaming unit has been growing quickly thanks to several big titles like hard-core game Momo Craft and Momo Fight the Landlord. Momo doubled down on this in 2016 as it retreated from a previous joint venture on game publishing in favor of in-house development. The effect of this strategy was evident, as its mobile game revenue surged 45 percent year-on-year to reach $11.3 million in Q4 2016.